This bowl is crocheted and felted with 100% wool. It is double thick to give it extra stability. 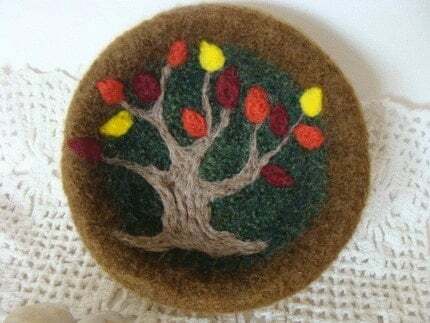 The tree and leaves are needlefelted. The bowl depicts a tree in all it's autumn beauty and reminds us that ryhthym of nature is consistent, yet ever changing. Use the bowl to hold pinecones, acorns, candy, change, buttons, paperclips... the list goes on. Measures 5 inches wide and 2 inches high. Folksy :: Buy "Autumn Trees"
Folksy :: Buy "Card - Orange Tree"